Have you been teetering on the edge, trying to build a true business from your writing or copywriting skills, close to breaking through, but not quite there? Go see Jersey Boys on the big screen or the stage. You won’t be disappointed. Last week I took my son, Solomon, to go see Jersey Boys at a movie theater in Quito, Ecuador. Solomon is a budding musician who’s had some small local success, but yearns to make it big and isn’t willing to wait a couple years. Truth be told, I hoped to find some golden nuggets of success wisdom myself. We both came away changed. While the Four Seasons’ sound of perfect harmonies is legendary (“Sherry,” “Big Girls Don’t Cry,” “Walk Like a Man”), little was known about the struggles they overcame as they rose to fame. 1. Find someone who believes in you and can mentor you. Christopher Walken’s character Gyp DeCarlo is that person for Frankie, taking him under his wing, encouraging him before he’s big, and giving him sound business advice. 2. Choose your friends and business associates wisely. Early on we see Frankie get mixed up with the law, and it’s a curse that stays with him throughout the film. Most of us don’t have friends who will end up in the joint, but we still need to be careful about who we associate it and what type of clients we seek. Discernment is specially important when choosing business partners, if at all. 3. Do your exercises. At different times DeCarlo, Tommy DeVito, and Nick Massi all tell Frankie to “do your exercises,” meaning his vocal exercises. He had a naturally beautiful voice, but he still needed to practice. So do we. Whatever level you’ve achieved so far with your writing, don’t rest on your laurels. And don’t just practice for the sake of practicing (for example, copying examples of good copy to ingrain the rhythm, cadence, and flow into your own copywriting). Practice by stretching yourself and taking on challenging projects that force you to continue to develop your voice and style. 4. Work at it. The Beatles paid their dues in the clubs in Hamburg from August 1960 to December 1962. The Four Seasons honed their skills in small clubs and lounges all over the country in the late 50s and early 60s before finally scoring a hit (a #1 hit) with “Sherry” in 1962. Chances are you’ll have to pay your dues before you strike it big in the copywriting world. Accept the fact that the overnight success stories you hear about are rare. 5. Develop your own style. Before the Four Seasons became known as the Four Seasons, they went through 18 different stage names and a lot of different sounds, including a stint for a year as back-up vocalists to bigger artists. Nothing wrong with taking some time to figure out who you really are as long as you eventually settle on a name, a “sound,” a style, and something I talk about a lot – a brand. 6. Take your show on the road. Wouldn’t it be great if all our clients came to us via “magnetic marketing” systems? No matter how great a copywriter you are or how great your in-bound marketing systems are, chances are you’ll have to be like the Four Seasons and actively pursue clients. 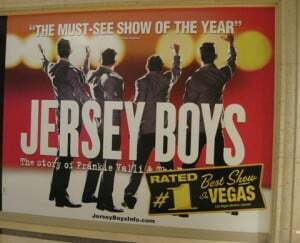 They took their show on the road early in their career (see #4 above), and Frankie Valli also took his show on the road to Las Vegas later in his career (to pay off a band member’s debt). Do what it takes to make your business successful. 7. Recognize your talents. All four of the Four Seasons recognized that Frankie had the golden voice, and they knew Bob Gaudio was the songwriting magician. Develop your strengths and gifts, and don’t worry about the stuff you’re not good at. 8. Go where the money is. Early on Valli and Gaudio realized that the money wasn’t in writing or performing the songs. The money was in controlling the rights to the songs. The two of them formed The Four Season Partnership, with each of them owning fifty percent of the act and its assets, including virtually all of its recording catalog. HUGE. Likewise, for independent creatives like us, the big money isn’t in being a copywriting hired gun. It’s in forming a business using your copywriting skills and building true equity. I’ll be talking a lot more about this in the coming months, and showing you how to do it. 9. Go big but don’t shun the small stuff. Even after the Four Seasons performed on American Bandstand and The Ed Sullivan Show, they were still willing to play the small clubs to continue reaching more fans and making money. Frankie Valli continued to drive an old car and live in a housing project until the mid-1960s, when success finally seemed real. You may land a big client or two, with a fat fee including royalties, but be open to doing “bread and butter” projects that are smaller, perhaps steadier, and combined can add up to substantial amounts. 10. Reinvent yourself when you need to. Throughout the Four Seasons’ career, they’ve had 24 different names, six record labels, and many stylistic changes as the culture and taste of fans changed. You may need to do the same, too. What worked for you in 2010 may not work anymore in 2015. The competition may catch up, hot niches come and go, and the demand for your services could turn on a dime. As an Independent Creative, be prepared to reinvent yourself, often. 11. Keep going even when it’s not fun. As much as they loved performing, the Four Seasons – especially Gaudio and Valli – always looked at it as a business. Writing, copywriting, marketing, and selling won’t always be fun (although when you’re making good money they usually are), so look at what you’re doing as building a business, not an outlet for the creative expression of your talents. 12. Have a long-term vision. Along those same lines, decide that you’re in it for the long haul. At one point in the movie, Valli says, “That’s why I’m still out there singin’, like that bunny on TV with the battery, I just keep goin’ and goin’ and goin’… chasin’ the music, tryin’ to get home.” Singing is what he’s about, and the Four Seasons are the only group to have a Top 100 Billboard hit in each decade of the 50s, 60s, 70s, 80s, and 90s. Do you see your business lasting not only a few years, but decades like the Four Seasons’ business? 13. When everything seems lost, press on. “You gotta climb out of this, Frankie,” implores his mentor and friend, DeCarlo, when Valli discovers that the band is $665,000 in debt. And climb out of it he did. Transforming himself into a solo act with a back-up band reminiscent of the Big Band era, he scores a #2 hit with Can’t Take My Eyes Off of You” in May of 1967. If you have the talent as a copywriter and marketer, you can always climb out of a bleak situation with one good idea. 14. If you have one or two good friends through it all, you’re doing well. In spite of losing his marriage, his daughter, and a lot of money that was out of his control, Valli’s friends Bob Gaudio and Gyp DeCarlo were always there for him. Count your blessings if you have a true friend or two. Even better if they’re in the business and can understand what you’re going through. If you feel passionate about a new direction, and it fits your style, voice, and brand, go for it. Have you seen the movie or musical? Any lessons I missed? Let me know here. Wow Steve…a virtual landslide of business building lessons … all recorded in the dark! I’m sending you a lighted pen for your next trip to the theater. Who knows what more shedding a little light might beget. A lighted pen would serve me well, Alan! I’ve been known to do this before, too (I think I wrote a piece once that tied writing in with the movie “Limitless”). I need to take a cue from my son, Alex, who’s a student critic for our local Overture Center (and gets to see all the Broadway-type shows that come through). Great advice for business and life! Love the piece – thanks, Steve. Have to see the movie now, too. – Find someone who believes in you and can mentor you. – Practice by stretching yourself and taking on challenging projects that force you to continue to develop your voice and style. – Develop your own style. … Nothing wrong with taking some time to figure out who you really are as long as you eventually settle on a name, a “sound,” a style, and something I talk about a lot – a brand. – …actively pursue clients. … Do what it takes to make your business successful. – Develop your strengths and gifts, and don’t worry about the stuff you’re not good at. – Go where the money is. – …be open to doing “bread and butter” projects that are smaller, perhaps steadier, and combined can add up to substantial amounts. – Reinvent yourself when you need to. … As an Independent Creative, be prepared to reinvent yourself, often. – …look at what you’re doing as building a business, not an outlet for the creative expression of your talents. – Have a long-term vision. …decide that you’re in it for the long haul. …like that bunny on TV with the battery … just keep goin’ and goin’ and goin’ … see your business lasting not only a few years, but decades. – When everything seems lost, press on. … If you have the talent as a copywriter and marketer, you can always climb out of a bleak situation with one good idea. – Count your blessings if you have a true friend or two. Even better if they’re in the business and can understand what you’re going through. – When you find the “next thing,” run with it. … When everyone else is “zigging,” maybe it’s time for you to “zag.” If you feel passionate about a new direction, and it fits your style, voice, and brand, go for it. Glad you got something out of it, Everett. It really is a great movie, and now I’m planning to see the musical (probably in Chicago, less than 3 hours away). And I’ll probably see the movie again, too! all above comments already made. No use in being redundant. That’s a copywriter no-no. Thanks for lighting the path with hope and inspiration for your fellow copywriters. Steve, great article and impeccable timing. Especially #5. I’ve been working on finding my style and sound for awhile, maybe too long. I need to schedule a call with you and get it figured out. I know I can write, and I’ve studied marketing and marketers for awhile. Now I just need to figure out how I’m going to make money doing it. Thanks for your comment. I’d love to help. I know you’re well-versed in marketing. Now it’s time to leverage all that knowledge. If you want to set up a time, go to bit.ly/TimeWithSteve and reserve however much time you’d like. We’ll get something on the books in the next couple weeks and get your business rolling.